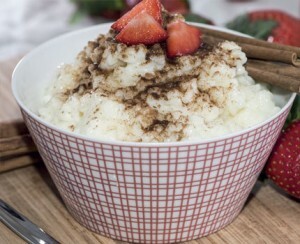 Dietitian’s tip: Make this fruited rice pudding ahead of time, refrigerate and serve cold. Or serve this dessert warm, right from the oven. In a medium saucepan, bring 2 cups of water to a boil. Add the rice and cook about 10 minutes. Pour into a colander and drain thoroughly. In the same saucepan, add the evaporated milk and brown sugar. Cook until hot. Add the cooked rice, lemon zest and vanilla extract. Simmer over low heat until the mixture is thick and the rice is tender, about 30 minutes Remove from the heat and cool. In a small bowl, whisk together the egg whites. Pour into the rice mixture. Add the pineapple, raisins and apricots. Stir until well blended. Preheat the oven to 325 F. Lightly coat a baking dish with cooking spray. Spoon the pudding and fruit mixture into the baking dish. Bake until the pudding is set, about 20 minutes. Serve warm or cold.